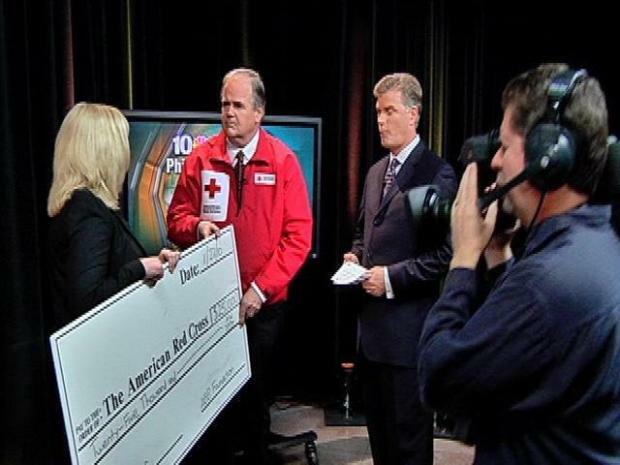 Thousands of NBC 10 viewers showed their support for victims of the Haiti earthquake disaster during Friday night's live telethon donating a total of $733,839 --$123,350 in phone bank donations and $610,489 from local companies. All donations went to the Red Cross. Huge donations poured in from Morgan, Lewis & Bockius Law Firm who donated more than $335,489, ACE Mid-Atlantic donated 250,00 and ABB, Inc. donated $25,000. That generous amount is expected to increase as thousands of donations are still coming in online at NBCPhiladelphia.com. Our Hope for Haiti telethon featured live performances by world-famous bands and musicians. People across the Delaware Valley donated big to help rebuild Haiti. Locksley -- the British Invasion-style American rock band out of Brooklyn -- performed along with the famed Adam Crossley, the billboard chart topper whose vocal talent has been compared to Sting, Coldplay and Ryan Adams. Mutlu, the Philly-born soul musician and Kathy Sledge (Sister Sledge) are performed during the telethon. Other special guests included B101's Michael Chew, WXPN's David Dye, WDAS' Patty Jackson, members of the Philadelphia Police Department and many more. If you want to donate, call the Red Cross at 800-RED-CROSS, or just fill out the donation form online. The size of the donation doesn’t matter because every little bit helps.